This entry was posted in Bulk Containers, Wire Baskets on January 7, 2019 by dmadden. This entry was posted in Bulk Containers, Carts, Laundry Carts, Wire Baskets on October 12, 2018 by dmadden. This entry was posted in Bulk Containers, IBC Totes, Wire Baskets on October 8, 2018 by dmadden. This entry was posted in Bulk Containers, Shipping Containers, Wire Baskets on April 9, 2018 by dmadden. Visibility. When it comes to storage, there is no greater benefit for a storage container than to be see-through. This visibility allows employees the ability to see what is in a basket without having to take the time to physically open each container. This saves time and increases production. Inventory. 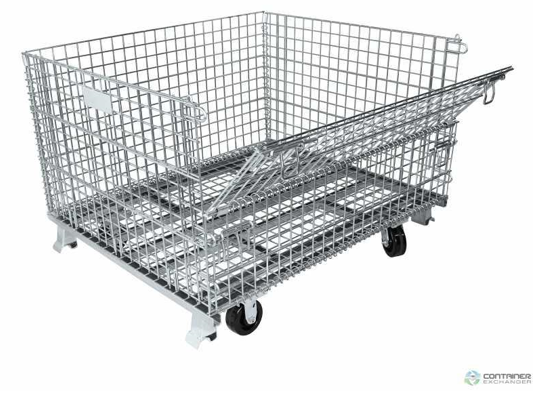 Not only does increased visibility of wire baskets allow employees to see what is in each basket, it also allows them to see how many are in the baskets. This allows for a faster inventory of products and materials and facilitates a faster inventory process. Space saving. Wire baskets are stackable. 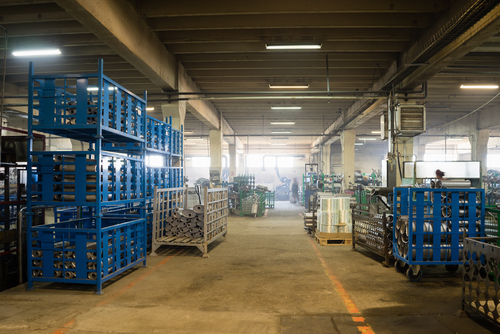 This means that manufacturing companies can increase their storage capacity by being able to utilize vertical space without the need to purchase stack racks or other forms of shelving or storage. Drainage. In manufacturing facilities, storage containers are often exposed to water or other substances that can cause damage to the contents if not properly drained. 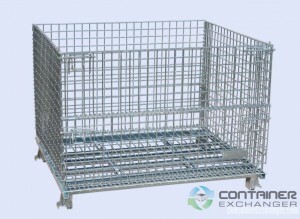 Because wire baskets are made with metal wire, they provide adequate drainage, which prevents unnecessary damage to the products or materials stored inside. Venting. The porous surface of wire baskets also prevents potentially harmful vapors from building up inside the container. The gaps in between the metal wires allows for safe gas venting into the atmosphere. As you can see, wire baskets are an invaluable part of the manufacturing environment. 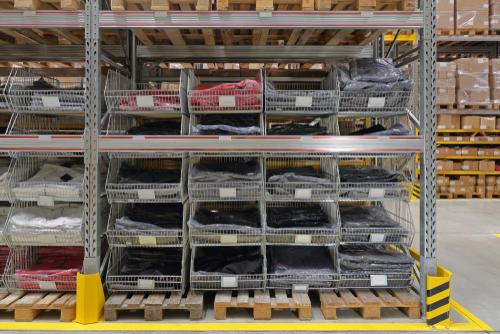 They provide exceptional storage and shipping solutions for manufacturers of all types and can be used in many different scenarios. This entry was posted in Bulk Containers, Wire Baskets on December 30, 2014 by madden_david. Collapsible containers are known throughout the manufacturing industry as ‘smart packaging’. This type of returnable packaging comes in several styles – plastic collapsible containers and metal collapsible containers. These collapsible containers can be used again and again and offer lots of durability, typically with the ability to handle 1,500 to 4,000 lbs. Depending upon the style and size. Metal collapsible containers are very popular and widely used throughout many industries for bulk material handling. Combining the dual ability of being light but strong – they have lots of muscle with a low weight-to-load ratio, and can easily be stacked 3-4 high providing a high amount of visibility while conserving space and making it easy to see inventory. Plastic collapsible containers have solid walls and the option of solid or vented bottoms to meet your particular warehouse needs. These type containers offer exceptional strength and product protection while offering supreme savings in return freight and storage costs for these collapsible containers. Plastic collapsible containers also feature fork access on two or four sides depending upon style which allows more efficient loading, unloading, and maneuvering in trailers and storage areas of manufacturing environments. The sides of the box have the ability to be released and collapsed into a stackable and compact unit. When the walls are locked up into place, they have the ability to be stacked on top of each other, typically up to six high while protecting your product. Plastic collapsible containers also come have the option of coming in Heavy-Duty Style boxes and Extended Length collapsible containers. Such plastic collapsible containers typically range in size from 30×32 in length x width to 70 x 48, with height variations of 25 to 50 inches. Container Exchanger offers you the ability to purchase high quality collapsible containers on the used secondary market as well as maximizing your ROI if you are looking to sell some used plastic collapsible containers or metal collapsible containers. Learn how the use of used plastic collapsible containers and used wire collapsible containers can add to your bottom line. 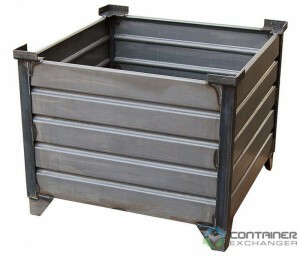 Find or list your collapsible container on http://www.containerexchanger.com/. This entry was posted in Bulk Containers, Metal Bins, Pallet Containers, Wire Baskets on May 30, 2014 by madden_david. 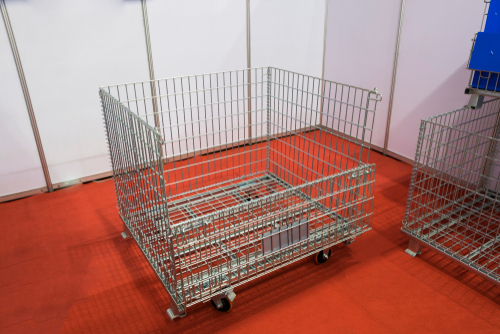 Wire containers and wire mesh containers are very durable and provide the user with the ability for quick content visibility of the wire container, along with easy identification for inventory control. 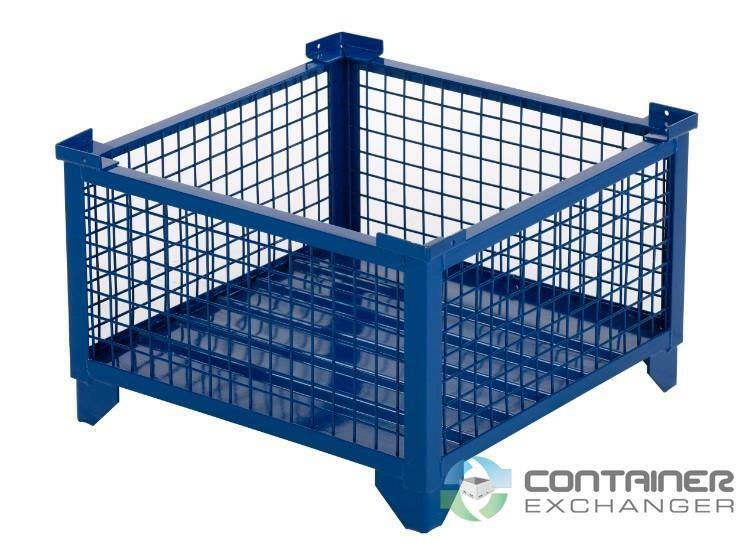 The wire mesh containers also have the added benefit of being stackable and collapsible while promoting material flow and more efficient stock control. Perhaps more importantly, as companies across North America are becoming more cognizant of the importance of conservation, wire containers and wire mesh containers are sturdy and durable products which offer the opportunity to be reused many times. At the end of its useful life, it can also be recycled. This type of returnable packaging has aided companies, particularly in the United States to act as leaders in environmental protection and energy conservation. Wire mesh containers are very popular and widely used throughout many industries for bulk material handling. Combining the dual ability of being light but strong – they have lots of muscle with a low weight-to-load ratio, and can easily be stacked 3-4 high providing a high amount of visibility while conserving space and making it easy to see inventory. Mattel Toys is a United States company which switched to wire mesh containers within its plant in Murray, Kentucky. Producing all types of toys, Mattel’s previous usage of plastic bins or corrugated boxes was made obsolete by the switch to the wire containers. The zinc-plated wire container that Mattel switched to will not rust and wire containers have the added benefit if being able to be fitted with casters allowing them to be towed several at a time. 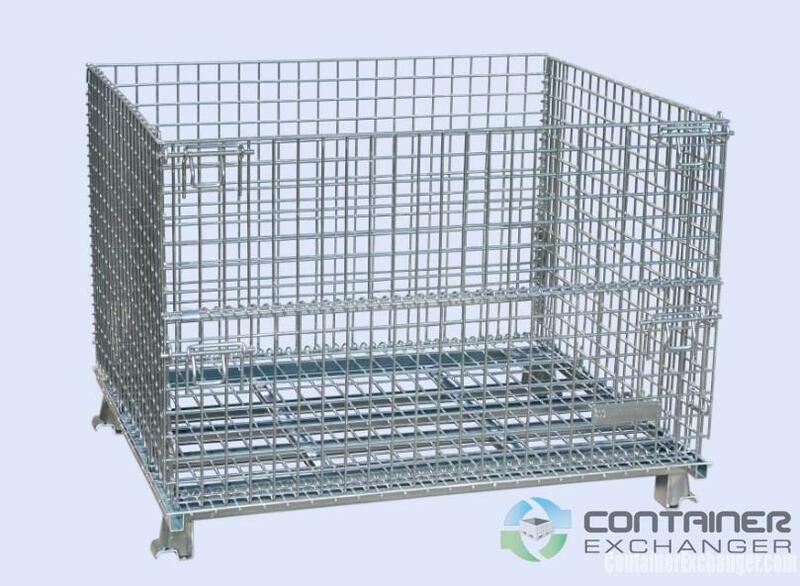 If you’re interested in purchasing wire mesh containers, ContainerExchanger.com can be a good source for both new and used wire containers. Most of the wire containers offered by Container Exchanger are steel, but some come as galvanized or zinc-plated as well. Be sure to read the listings thoroughly to determine the exact style of wire container you are purchasing. There are two types of wire containers available, the collapsible wire container and the rigid wire containers. Collapsible wire containers are typically lighter than rigid, with a weight capacity of 1,500 to 4,000 lbs. Rigid wire containers are able to withstand a great deal of abuse and thus are more durable. Their square tube construction on the corner posts allow for easy stacking of the wire container and Container Exchanger has a very nice inventory of these type containers at great value pricing. Learn how the use of used wire containers and used wire mesh containers can add to your bottom line. This entry was posted in Bulk Containers, Metal Bins, Wire Baskets on May 30, 2014 by madden_david.